Once you go through the steps below, with just a few simple tweaks on the fly, you'll know how to make an endless variety of yummy, nutrient-dense, and dairy-free smoothies and soft ice creams, all with a blender and a few inexpensive ingredients. 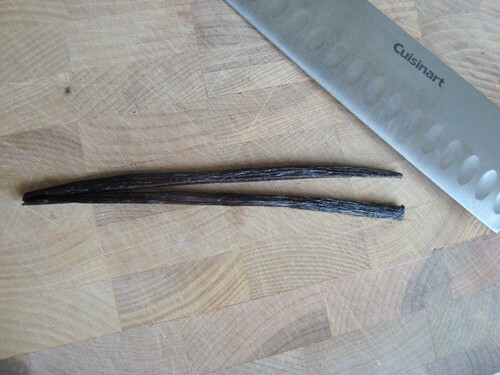 Use the pointed end of your knife to carefully split the vanilla bean in two, length-wise. 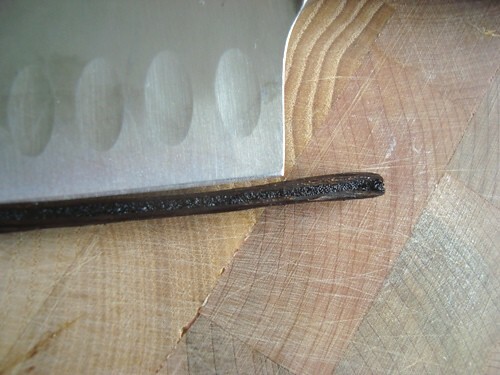 This is a look at the cut surface of half a vanilla bean - see the chewy-looking flesh in the middle? That's a collection of hundreds of vanilla bean specks. There's probably a more accurate name for these specks. I've just always called them specks. Nice, right? Save these vanilla bean specks for just a bit later. Now add some frozen banana slices to your best blender - you'll want to use about a cup of banana slices for each serving you want to make. Frozen banana slices are really the one essential requirement for sweet and creamy smoothies and soft ice creams. We almost always buy extra bananas when we go grocery shopping, and when our extras get nice and ripe, we slice them up and keep them in an air-tight bag or container in the freezer. If you're not already doing this with your smoothies and using ice instead, you really owe it to yourself to give it a go. I can pretty much guarantee that you'll never go back to ice-based smoothies. 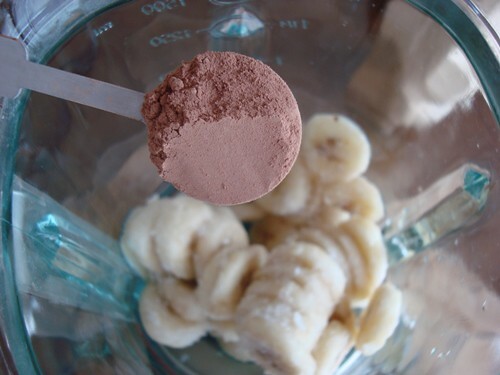 Now, add a teaspoon of quality cocoa powder to the mix - about one teaspoon per cup of frozen banana slices is the right amount for most people. If you want to make, say, a berry-flavored smoothie, simply avoid the cocoa and add fresh or frozen berries. About two heaping tablespoons of any type of fresh berry works quite well. And if you want a straight vanilla smoothie or soft ice cream, don't add anything but the vanilla. And here's where the vanilla comes in. 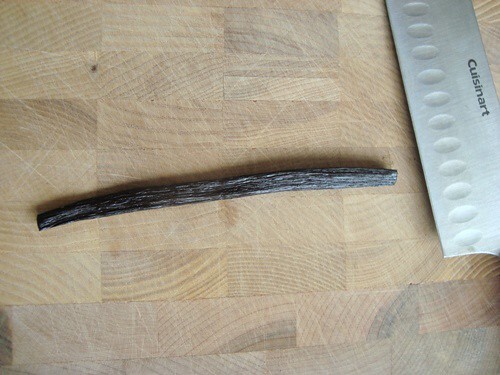 You'll need to use your finger or a utensil to scrape the vanilla beans into the mix. Now add just enough non-dairy milk to give your blender the bite it needs to bring everything together. About a cup of non-dairy milk per cup of frozen banana slices is a good amount, but try starting with just a bit less - you can always add a bit more if needed. We typically use almond milk. See the real vanilla specks in there? 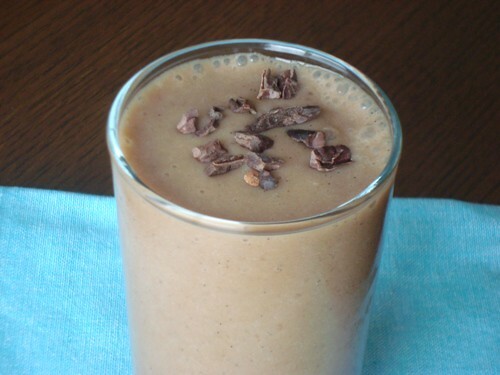 If you like extra texture to your smoothies, sprinkle a small handful of cocoa nibs or non-dairy chocolate chips on top. This is one fabulous smoothie that will not let you down. 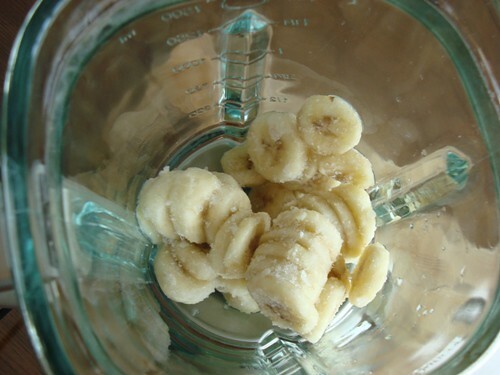 Ah, one thing to note: Because it's best to start with too little rather than too much milk while blending, you may need to pause the blender at times and use a utensil to push the unblended banana slices toward the blades. I'm a tad bit aggressive in just about everything I do, so I usually just jostle the blender a bit as it's blending, and this tends to do the trick. But jostling a live blender isn't something I can recommend without being by your side to guide you on proper form. So try the pause-and-scrape-down method first, please. One other note: If you have a heavy-duty blender, like a vita-mix, use half to three-quarters of a cup of milk per cup of banana slices, and you'll end up with ice cream that really looks and tastes like ice cream. One last thing: If you don't have easy access to vanilla beans, do not hesitate to make this smoothie without it. Real vanilla adds a lovely layer of flavor, but even without it, I'm pretty sure that you and those you make this for will be quite pleased. how a bout a little agave or a majool date? 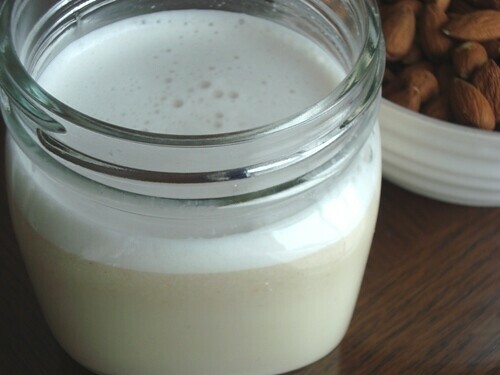 i love this drink and have it often with home made almond milk. its like doing something bad...only its not. 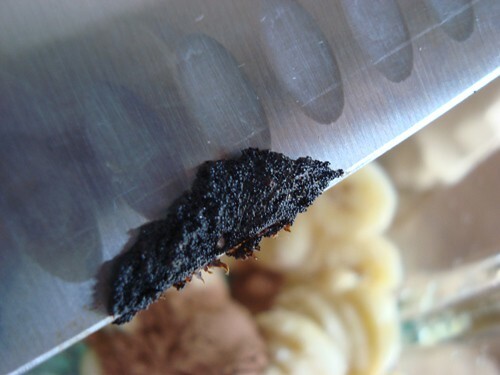 Hi--I always use the ripest bananas possible- the more brown spots the better. They're very high in sugar to offset the bitternesss of the cocoa. You might want to add a touch of sweetener, though, if you add some protein to the shake. I love to add combinations of ground flaxseed, ground chia or ground cashews. Cashew cream, which you can easily make by soaking cashews overnight & then blending thoroughly with a little almond milk or water, makes any smoothie amazingly creamy while adding lots of nutrients. I very much enjoy the pictorial recipes. Can't wait to try the smoothie! And thanks for the link to the vanilla bean place...I immediately ordered some. Hi there Wendy...yes, I only use the inside speckled part, though I think little bits of the outer fiber do make their way in from time to time. We just compost what's left, though I'm sure there's something you could do with them...perhaps someone out there can help us out on this one. You can always take the pod after scraping the specks out and cover with sugar or even stevia powder to make vanilla sugar for future recipes. Let set in a covered jar until ready to use. Let set at least awhile so the flavor has time to settle into the sugar. The "specks" are vanilla seeds. I don't recommend using a finger to remove the seeds - as one would be using their nail and this is not a sanitary practice - lots of germs under nails! 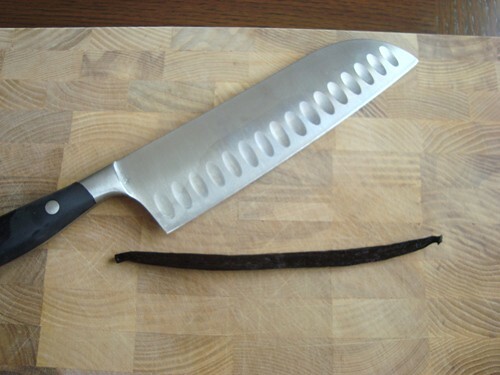 It is easy to scrape the seeds with a knife. The pods are great to put in a bottle of vodka. 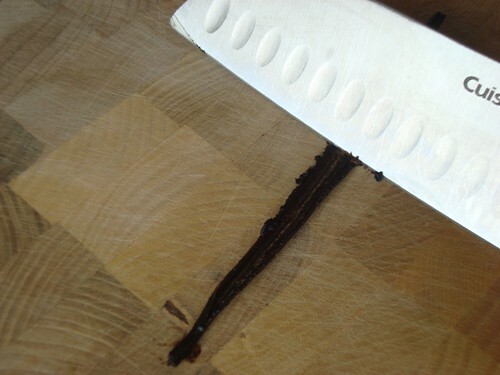 Over time, when you have enough pods, you will have made your own vanilla extract. I add a lot of water so that it is not straight vodka. You can also use the pods to flavor other things, too - just put them in a glass jar with whatever you wish to flavor - such as coffee beans. If you have a high-speed blender such as a vitamix, all you have to do is slice an inch off of the whole bean, pod and all and blend. The pod has a lot of vanilla flavor and the blender breaks it down perfectcly. You can add greens to this smoothie to make it even more healthy. Put it in vodka to make an extract. Leave a couple of wks. in the dark. Shake every day. That was so delicious!!! I read your article and immediately made it, as I happened to have all the ingredients in the house, although my frozen bananas were not sliced and I think my vanilla bean was a bit old ... nevertheless, it was excellent. This smoothie recipe sounds yummy and I can not wait to try it. I have one question...does the cocoa powder have caffeine? Cocoa beans undergo a process of drying and fermentation to develop the flavor and color. The amount of caffeine in the beans varies with the type of beans and the degree of fermentation. As cocoa powder comes from cocoa beans it also contains caffeine. Depending on the degree of fermentation and the type of cocoa beans, the caffeine content will vary from 0.1-0.5%. In cocoa powders made from well fermented African cocoa beans the caffeine proportion is in general very low: 0.1% or less. This IS a wonderful recipe. Since I purchased the chocolate flavored protein powder and the powdered coconut milk, I have been making wonderful smoothies with these items, plus I add a banana and a scoop of Almond butter !! YUMMY !! It is a meal !! ...about "raw" cocoa powder: why is it better than roasted? Isn't roasting a traditional procedure? Wouldn't it guarantee a bacteria-free product & maybe intensification of flavour? I'm just guessing here, but I always thought that there was some legitimate reason for roasting, possibly increased digestibility, too. Pls help, anyone who has this knowledge. Thanks! 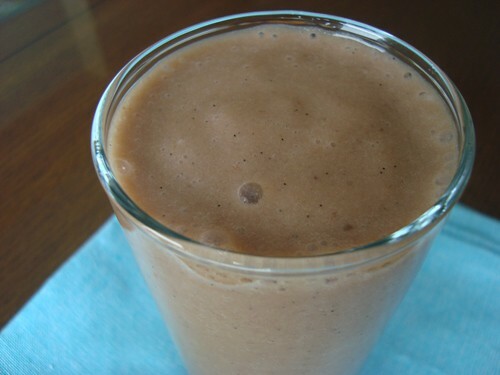 Thank you so much for this chocolate smoothie recipe, it has really helped me to reduce my sugar consumption! I love the way it tastes.